If you are a homeowner who is interested in keeping your lawn perfectly manicured without the mess, hassle, and expense of cumbersome gas or electric mowers, then finding the best reel mower out there is one of the the smartest decisions that you can make. Synonymous with the classic image of lawn mowing, these manual push mowers were once to go-to solution for trimming the grass long before its gas, battery, and electric lawn mower rivals came on the market. Not surprisingly, they’re still a favorite among many homeowners with small or medium-sized yards. For homeowners with larger yards, you may wish to look at our list of the top riding mowers. If you are looking for the best overall lawn mower – read the review here. View the Best Reel Mower on the Market, Below. How to Cut Tall Grass with a Reel Mower? How to Use a Reel Mower? Should I Get a Reel Mower? And with modern advances in design and features, reel mowers are experiencing a major resurgence in popularity since they’re now easier to push than ever before. With silent operation and zero emissions, these mowers are a clean, quiet alternative to gas and electricity-guzzling mowers. But not only are these manual garden tools environmentally-friendly and incredibly easy to store, a reel device is also lightweight and easy to operate. And let’s not forget that these easy-to-use mowers are actually healthier for your lawn. For a supposedly easier option, you can opt for a string trimmer (see here). Or view the top gas string trimmer tools. Earning the top spot in our review of the best reel mowers is American’s 1815. 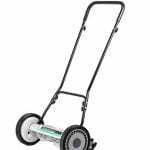 The American Lawn Mower Company has been manufacturing high quality lawn tools for over 120 years and their American Lawn Mower 1985 18” 5-Blade Reel Lawn Mower is simply one of the best mowers on the market in 2019. With sturdy construction and a wide 18” cutting path, this mower makes large, clean swathes across your lawn allowing you to tackle a medium-sized lawn in no time. With its 5 tempered alloy steel blades and a ball bearing design, the 1815 Reel Mower is tough and makes precise cuttings on each and every pass across your lawn. Its 10” wheels are large enough to conquer unsteady terrain and, weighing in at only 29 lbs, this reel mower is also incredibly easy to maneuver. The 1815 Reel Mower also allows you to quickly adjust your cutting height from ½” to 2 ¾”, ensuring you can achieve the perfect cut for your type of grass. And with its fold-down handles and simple design, storing it is a breeze. See more information on American 1815-18. The American Lawn Mower Company has been making quality products for over a century and this reel mower is no exception. It’s remarkably easy to use and store away while being lightweight and sturdy enough to navigate across even a medium-sized lawn. It performs incredibly well, leaving crisp, clean cuts in its 18” path and is one of the best mowers on the market in 2017. It’s one of the most impressive models in our review and is perfect for any homeowner. The Fiskars StaySharp Max Reel Mower is one of the best reel mowers on the market today, earning the second spot in our review. Sturdy, well-designed, and adjustable, this is the perfect option for anyone looking for a greener, healthier way to manage their landscaping tasks. This mower is easy to push and can make any lawn look professional and beautiful. This 18” wide reel mower features InertiaDrive technology with a large-diameter cutting reel and thicker blades which allow it to offer double the cutting power. Plus, the precision-ground blades of the StaySharp Cutting System never makes contact with the stationary reel, allowing for improved blade life, sharpness, easier mowing, and precise cuts. Designed with inset wheels, this reel mower makes edging easy, allowing you to cut narrow strips along sidewalks, walkways, and paths, solving one of the few consumer gripes associated with these manual mowers. A chain-drive design offers improved inertia, making it 60% easier to push the StaySharp Max than competing reel mowers. And for versatility, this mower allows you to adjust several things including the handle height, lawn cutting height (from 1” to 4”), and the direction of the grass clippings shoot. See more information on Fiskars StaySharp Max. At just under $200, the Fiskars StaySharp Max Reel Mower is the most expensive model in our review. It is a premium option but it’s also one of the best reel mowers on the market today. It’s built to last and its blades deliver precise, clean cuts through even the toughest patches of your lawn. Its 1” to 4” cutting height ability is one of the largest ranges offered, making it perfect for any lawn. While it weighs 51.7 lbs, its design allows it to be pushed along easily and with its 5 long-lasting blades, it can make quick work out of any lawn making it one of the best buys today. The American Lawn Mower Company makes our review of the 10 best reel mowers of 2019 again with the 1204 14” Reel Mower. This compact, lightweight tool delivers the exceptional performance that you’d expect from a brand that’s been making high-quality lawn mowers and accessories for over a century and is the best choice for homeowners with a small lawn. Designed with 4 long-lasting, precision blades and a tempered alloy steel reel and bed knife blade, this reel mower delivers a clean, precise, scissor-like cut to your lawn. With a 14” cutting width and adjustable cutting height from ½” to 1 ¾”, it can make quick passes while allowing you to select the best cut height for your type of grass. The 1204 Reel Mower was built with 8 ½” high impact, polymer wheels that can easily navigate across your lawn and at only 19 lbs, it’s easy to push this mower along your yard. This lightweight reel mower is incredibly easy to operate and store away in your shed or garage when it’s not in use, taking up very little storage space. See more information on American 1204-14. The 1204 Reel Mower is a great lawn product from The American Lawn Mower Company. It’s tough and easy to use while delivering clean, precise, scissor-like clippings. This lightweight reel mower comes in at just over $70, making it one of the best bargains featured in our review. With a 14” cutting width, it’s perfect for anyone looking for an affordable way to cut their small lawn while homeowners with a medium-sized property might be better off purchasing a model with an 18” cutting width like the American Lawn Mower Company’s 1815. The Great States 415 16” Reel Mower isn’t just one of the most affordable models listed in our review, it’s also an incredibly well-made tool that delivers reliable, precise results. Its heat-treated tempered alloy steel blades and reel are durable and stay sharper longer than many of its competitors for years of reliable performance. Lightweight and easily maneuvered, this is a great economical reel mower for homeowners who have a property with a small lawn. Its 10” ball bearing wheels allow you to navigate this environmentally-friendly tool around your lawn quickly and an unbreakable steel side plate offers additional protection and resilience. And with a 16” cutting width, this reel mower is capable of making wide cutting swathes so you can cut your lawn in no time with zero noise and pollution. For comfort, the T-style handle has cushioned grips and is powder-coated for rust prevention. The cutting height of this reel mower can be adjusted from ½” to 2 ½”, allowing you to select the perfect cutting height for the type of grass growing on your lawn. See more information on Great States 415-16. Priced at around $70, the Great States 415 is one of the more affordable mowers featured in our review of the best reel mowers of 2017. While it’s great that this is a very inexpensive reel mower, it wouldn’t mean much if it wasn’t’ up to the job. Luckily, this reel mower is incredibly reliable and delivers clean, precise lawn cutting performance in any grass condition. With adjustability and a durable design, it’s one of the best options for anyone looking for an easier, healthier way of maintaining their small or medium lawn. Scott gets a place in our review with the Scotts 2000 20” Reel Mower. It is one of the best reel mowers available on the market today. With its generous 20” cutting width, this reel mower is capable of making quick work out of even a medium-sized lawn. And with a unique rear wheel design, it reduces drag for easy maneuverability, speeding up the lawn mowing process. With 10” dual tracking wheels and radial tires, the 2000 Reel Mower is extremely stable and easy to push along. Its 5 heat-treated steel blades are sharp and resilient, leaving crisp, scissor-like clippings for a beautiful, well-manicured lawn. And with 9 adjustable cutting heights from 1” to 3”, you can quickly adjust to get perfect cutting height for your lawn. A comfortable foam-grip loop handle makes operating this reel mower easy. And a welded protective reel hood helps protect overhanging bushes and shrubs from accidental damage, which is great for when you’re trimming along the edges of your lawn. See more information on Scotts 2000-20. The Scotts 2000 Reel Mower is a solid, precise, easy-to-use model and, at just over $130, is one of the best deals out of any model we’ve mentioned in our review. Built to last and featuring rear wheel stability, 5 heat-treated cutting blades, and 9 cutting height options, it is remarkably well-designed. And its 20” cutting width allows it to easily tackle even a medium-sized lawn. Delivering great results and long-lasting reliability, it’s one of the best purchases on the market today. The Greenworks 25072 Reel Mower earns 6th place in our review of the 10 best reel mowers of 2019. It is a simple, well-designed reel mower that allows you to cut your small or medium lawn quickly and efficiently, leaving your yard looking clean, healthy, and perfectly trimmed. It’s affordably priced, lightweight, and best of all, even comes with a rear bag for easy collection of grass clippings. A wide 20” cutting path allows this reel mower to make generous cutting swathes across your lawn, allowing you to mow your grass in less passes than other smaller reel mowers on the market. A 9-position height adjustment from 1 ¾” to 2 ¾” lets you set the cutting height for all types of grass. And its 10” front wheels and 6” rear wheels offer easier maneuverability and improved stability, further reducing the time it takes this reel mower to get the job done. With a comfortable handle and a light weight of only 31.8 lbs, this reel mower is easy to push and can be stored away in your shed or garage with ease. And with a 2-in-1 collection feature, you can choose between mulching and rear bagging. This means that you can either fertilize your lawn with the clippings or dispose of them for a more finished, tidier lawn. See more information on Greenworks 25072. The Greenworks 25072 is one of the best mowers discussed in our review if you’re looking for an affordable reel mower to manage a small or medium lawn. Its 20” cutting width is great for mowing the lawn, requiring you to make less passes than you would have to with a smaller model. The added ability to collect grass clippings thanks to the included rear bag is a great feature. And at only $85, it’s one of the best mowers in its class. The Remington RM3100 earns the 7th spot in our review easily. 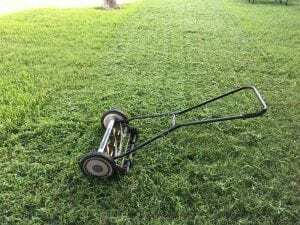 It is a great, affordable reel mower that is one of the best buys for a homeowner with a small lawn that needs regular mowing. With its 5 sharp and durable blades, it delivers clean, crisp cuts while its 10” wheels allow for easy maneuvering and a quicker mowing time. The cutting height adjustment is operated by a dual lever, allowing you to easily adjust the height from between ¾” to 2 ½”. And the 18” cutting width is perfect for a smaller lawn as well as getting to those narrow, hard-to-reach spaces. These mowers have an ergonomic handle that features a foam grip for added comfort and less user fatigue. And at only 28.4lb, this model is very easy to steer, push, and store away when not in use. While this tool makes fine, small grass clippings that are perfect for mulching and added vital nutrients to tour yard, it also comes with a rear collection bag for added versatility, giving you the added benefit of two disposal options. See more information on Remington RM3100. The Remington RM3100 is one of the best mowers for homeowners who have properties with a small lawn, narrow spaces, and tight turns due to its compact 18” cutting width, sturdy 10” wheels, and light weight. It performs incredibly well, making quick work of even a tough lawn with thick weed patches while leaving the yard with a clean, well-manicured appearance. With the option of rear collection, you can enjoy added versatility with one of these great mowers. And at less than $99, it’s one of the best deals on the market today and the most inexpensive model featured in our review. Earning another spot in our review of the 10 best mowers is the Fiskars StaySharp 17” Push Reel Mower. It is an impressive push mower that’s one of the best choices for anyone who owns a home with a small or medium lawn. It was designed to be durable but incredibly easy to use and is capable of quickly trimming the lawn with a minimal amount of hassle. With a 17” wide cutting path, the StaySharp 17” reel mower allows you to make quick work of mowing the lawn while its advanced design makes it 30% easier to push than comparable mowers. With its patent-pending InertiaDrive, this mower delivers 50% more cutting power, allowing it to easily cut through thick patches of weeds, twigs, and high grass spots without the mower jamming or slowing down. And with the StaySharp Cutting System, this manual push mower offers incredibly sharp, durable blades which last longer than those on many competing mowers, eliminating the need for you to perform any annual sharpening or maintenance. At just 40 lbs, it’s solidly-built for stability while still being incredibly easy to maneuver. See more information on Fiskars StaySharp. The Fiskars StaySharp is one of the best reel mowers highlighted in our review and is capable of delivering crisp, clean grass cuts, leaving your lawn looking beautiful and well-manicured. It’s sturdy and, with the increased performance from their InertiaDrive technology, it can power through tough patches that can jam other mowers on the market. With a 17” cutting path, it’s perfect for any yard and will be a reliable landscaping tool for years to come. The Sun Joe MJ501M makes our review of the 10 best reel mowers available today. It is a durable, lightweight, affordable option for any homeowner looking for a clean, healthy alternative to a gas or electric-powered lawn mower. This maintenance-free tool is easy to push and navigate and will leave your yard looking great. With an 18” cutting path, the MJ501M Mower is perfect for anyone who owns a property with either a small or medium yard. And its 9-position height adjustment feature lets you choose the perfect cutting height for any type of grass. Dual wheel design allows you to easily push this mower along your lawn for reduced work time and its hardened steel blades make clean, precise cuts. Plus, this Sun Joe model comes with a 6.6 gallon grass catcher. This allows you to choose from either mulching or rear collection. This means that you can either leave fine clippings scattered on your lawn to provide your soil with vital nutrients or collect the clippings while you mow, ensuring that your yard is clean and tidy once you’ve finished your yard work. See more information on Sun Joe MJ501M. The Sun Joe MJ501M is one of the best mowers featured in our review and is perfect for anyone looking for a budget-friendly and healthy way to mow their lawn. Its 18” cutting path is perfect for any small or medium yard, allowing you to finish the job faster than you could with a smaller mower. And with a durable but light body, it’s easy to push and store away. Plus, with the grass collection bag, you can mulch or bag your clippings for easier cleanup and a tidier lawn. At just under $80, it’s one of the best buys around and is perfect for anyone looking for a reliable reel mower. The Earthwise 1715 is one of the best mowers on the market and made the final spot in our review of the best push mowers of 2019 thanks to its performance, light weight, and durability. It offers efficient, clean cutting performance but at only 26lbs, these mowers are incredibly easy to push and maneuver. With a 16” cutting width, the 1715 is perfect for cutting a small yard or maneuvering in difficult areas with tight spots and turns. With 7 blades on a tempered alloy steel reel, these mowers make fast and efficient cuts. And with the 7 blades, it’s one of the best mowers for homeowners with bent-grass like the Bermuda, Zoysia, Centipede, St. Augustine, and Seashore Paspalum varieties. The 1715 Mower allows you to choose the cutting height from ½” to 2 ½”, so you can choose the right cutting height for your type of grass. And with an unbreakable steel side plate, this mower is incredibly durable and will withstand years of use. See more information on Earthwise 1715-16EW. At around $115, the Earthwise 1715 is one of the best mowers out there and is a terrific bargain for anyone looking for a well-made, durable reel mower. With a 16” cutting width, it’s perfect for any homeowner with a small yard. Its tempered steel alloy blades and steel side plate give it added durability while, at only 26 lbs, it’s easy to push and store away when not in use. Traditional rotary mowers hack at grass blades, tearing them and allowing them to lose vital fluids and be more susceptible to disease and bug attacks. But reel mowers cut each blade as if you were snipping it with a scissor, leaving a healthier, greener lawn in its path. Reel mowers come in a variety of styles and sizes. Some have special features designed to make the task of mowing the lawn faster and easier than ever before. And with a several great brands offering reel mowers in a wide range of prices, choosing the mower that’s right for you can be a difficult task. But we’ve done the difficult legwork for you by taking a look at the best of the reel mowers available. We examined their design, durability, features, and performance, and came up with our list of the 10 best rated reel mowers that are on the market in 2019. After reading through our reviews, you’ll be able to find the product that is ideal for your home’s lawn. While these mowers are a fantastic, easy way to mow your lawn, you might be concerned about maintenance issues like blade sharpening. Luckily, this task doesn’t have to be performed very often and when it’s time to sharpen your mower’s blades, it’s actually very easy to do. Due to the scissor-like clipping action of the blades’ motion, the edges of these manual mower’s blades don’t dull very quickly under normal use. Scraping against pebbles occasionally might lightly wear down the blades but for the most part, they’ll retain their sharp cutting edge for a very long time. After a few years of use, the mower’s blades will get slightly dull because they’re bound to be pushed over rocks, curbs, and thick twigs and these hard surfaces will take the edge off. Dull blades will cause the tool to stop operating smoothly and be more difficult to push. When you notice that your mower is not advancing as quickly as it used to, it’s best to first check the alignment of the mower’s reel and make sure that it doesn’t have to be adjusted. If the alignment is fine, then it’s time to sharpen your mower’s blades. Once you notice that your mower isn’t performing as well as it used to, it’s time to sharpen your blade. One of the best, and easiest, ways to do this is just to purchase a backlapping sharpening kit. These kits are fairly basic and include some sharpening compound and a handle. To use a backlapping sharpening kit you simply attach the included handle to the driving gear on your mower and use a paint brush to apply the sharpening compound to all of the blades. Then just crank the mower in a reverse direction, allowing the blades to scrape each other down, restoring their sharp edge. The only downside of this method is that it requires some elbow grease since you’ll be manually cranking the handle to rotate the mower’s blades. While a backlapping sharpening kit is the best way to sharpen your manual mower’s blades, you can also perform the task with a power drill and a sharpening attachment. These attachments fit onto a power drill and work just like a polishing brush attachment. To sharpen your blades with this method, you just pull the trigger of your drill and run the attachment along the edge of the blade, honing it to a sharper edge. One thing to keep in mind if you plan on using this method is that it’s best to either remove the blade reel or secure it prior to sharpening in order to avoid accidental injuries. While most mowers feature high-quality blades which will retain a sharp edge for several years, it’s a best to make this process part of an annual routine at the beginning or end of the mowing season. Since it’s the only maintenance you’ll ever be required to perform on this tool and it can be performed in a matter of minutes, it’s a good habit to get into and it will ensure that your reel mower offers the best performance possible. Once the blades are sharpened, you can simply put a thin coat of vegetable oil on the blade. This will help to prevent rust and corrosion without leaving a harmful residue on your grass. Years before the invention of the gas-powered tools, reel mowers were the tool of choice when it came to mowing your lawn. These mowers are relatively simple to use and are still an iconic symbol of suburban Americana. While they fell out of favor when the gas and electric mowers began growing in popularity, many homeowners still relied on these efficient, quiet manual mowers for their yard work. And thanks to an increase in health and environmental awareness, these devices have seen a remarkable resurgence in popularity. The push mower is incredibly basic, making it a great option for anyone looking for a maintenance-free alternative to powered mowers. They are designed with two or four wheels and feature a cutting reel with between 3 to 7 blades. These blades are normally made of a durable, resilient tempered steel or other metal for long-lasting sharpness. As you push the mower forward, its blades will spin vertically from north to south, lifting blades of grass between them and a bed knife. This action creates a scissor-cutting action which snips blades of grass as it advances. Since a reel mower is manually pushed and doesn’t have a motor, it is virtually silent and does not emit any fumes that are harmful to you, your family, or the environment. And with virtually no maintenance required to maintain these simple mowers, they are the preferred choice for many homeowners who are looking for a quieter, healthier, more affordable, and low maintenance mowing alternative. While a these mowers are terrific for mowing well-maintained yards because of their unique scissor-like clipping action, they can get bogged down when operating in overgrown areas causing it to be difficult to push the mower forward or even causing it to jam. Because of this, they are best suited for use in yards that are well maintained and that don’t measure much higher than 4” tall. While these mowers are not ideal for lawns that have grass higher than 4”, it can be done. It will just require a bit more time and patience. In order to use these push mowers to mow tall grass, you’ll need to adjust the way that you mow your lawn. The first thing to do is make sure that you are mowing with a generous overlap. This means that once you finish mowing one row across your yard, you turn around and go back with your mower in the other direction while overlapping your previous path by a few inches. This will make sure that you don’t have high streaks of grass between rows. Besides overlapping your cutting, you should also mow your lawn in one of the two following methods. Either one will allow you to efficiently cut high grass with a push mower. The first mowing method is to repeat each path twice. Simply mow each row once in one direction and then turn your mower around and cut it in the opposite direction. This will ensure that you are catching your lawn’s grass blades from both angles for a more even and thorough cut. The other method is called the checkerboard pattern. This method also involves you mowing each section of the lawn twice. Only with this movement, you will proceed to mow your lawn as you normally would but will then repeat the process in the opposite direction, crisscrossing your originally paths perpendicularly like a checkerboard. With these additional passes on each strip, you can use these manual mowers and achieve the clean, manicured appearance you are looking for even in tall grass conditions. Long before the invention of electric and gas-powered mowers, the reel was the classic way for homeowners to keep their lawn well-maintained. These manual mowers operate through a collection of blades which spins as you manually push the tool forward. As you advance forward, blades of grass fall between the mower’s blades and a sharp bed knife, allowing the mower to snip the grass similar to how a scissor works. With minimal maintenance and low cost, these mowers are a great, healthy alternative to powered mowers. And luckily, using them is remarkably simple. The first thing you’ll do is set the cutting height of your tool somewhere between 1 ½’ and 2 ½’. 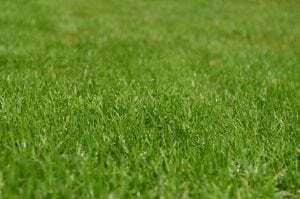 The right height is a matter of personal preference and will also depend on what type of grass you have since some varieties require particular cutting heights for optimum health. Most mowers will have an adjustable height setting. Depending on the model, this range can be offer settings from as low as ½” to as high as 4”. With the correct cutting height selected, you will simply push your mower forward at a normal walking pace, allowing the mechanism to rotate and the scissor-like movement of the blades and bed knife to do their work. Walk in a straight line from one end of the lawn to the other. At the end of your row, turn the mower around and make another swathe that slightly overlaps the first row. Simply repeat this movement until the whole section is mowed. Most push mowers will leave fine grass clippings behind on your lawn. These will decompose and provide nutrients like nitrogen to your soil for natural, healthy fertilization. Other models will come with detachable rear collection bags. These bags allow you to collect a majority of the clippings for disposal in a trash bag. This method is preferable for homeowners who like a cleaner, tidier looking lawn. While push mowers have been around for years, the popularity of gas and electric-powered rotary mowers has caused them to be used less frequently over the past few decades. But as the homeowners of today have begun to shift their thinking, many are now looking for a healthier, more economical alternative to these power-guzzling models. Unlike a gas model, which can emit 10-12 times as much harmful hydrocarbon as an automobile per hour of operation, reel mowers are 100% emission-free. This means no harmful fumes for you, your family, or the environment. Plus, they virtually wipe out noise pollution thanks to their silent operation. Both your family and neighbors will thank you for this. In addition to the environmental factors, manual push mowers don’t require oil changes, gas, or electricity, meaning they have zero operational cost and virtually no maintenance. This is all great, but if they weren’t capable of performing well, no one would be willing to switch to a reel mower. So let’s look at how well these manual tools can perform. If you’re interested in the importance of mowing – read the study here. Reel mowers are terrific for maintaining the health of your grass. Most landscaping professionals claim that using one of these mowers is not only great for the environment but they’re actually better for your property’s grass. Since they use a snipping action to cut grass compared to the tearing motion used by powered rotary mowers, they don’t damage your grass. A reel ensures that grass is cut evenly as if you were snipping it with a scissor compared to the tearing motion that a gas or electric model uses to mow. This allows your lawn to retain valuable moisture and be more resistant to bugs, disease, and drying out. These models are also designed to provide natural fertilization to your lawn for a healthier, brighter yard. This is done by mulching. The mower leaves fine clippings in its path which add key nutrients like nitrogen into the soil. This natural fertilizer is a great added benefit for your lawn and will save you the money you’d have to spend on comparable store-bought fertilizers. And if you aren’t a fan of leaving clippings on your lawn, some models come with rear bag attachments that can capture a fair amount of clippings for a cleaner, tidier look. Reel mowers are incredibly light and compact. This means that they’re not only easier to push and steer than a gas mower that weighs over 100 lbs, but it can also be stored in a garage or shed without taking up a lot of valuable storage space. These mowers are the most affordable tools that you can purchase to mow and maintain your yard’s appearance. Budget models can cost as low as $70. And even a premium model won’t cost you much more than $200. Plus, another major financial advantage is that once your initial investment is made, manual mowers cost virtually nothing to operate. This is a significant advantage over gas mowers that require you to purchase gas for fuel as well as oil for the occasional oil change. And they’re actually more cost effective than electric models too. This is because, since you’re not charging a battery or plugging in your tool, you won’t be adding a dime to your electric bill. Reel mowers were designed to perform efficiently on relatively short grass. If you are planning on mowing a yard with grass that is significantly taller than 4”, it is going to take more time and work than it would with a gas-powered mower (click to read the study on mowing). That said, with a few additional passes on each path, high grass can be cut with a push mower and once the lawn is back to a reasonable height, maintaining it is incredibly simple. Due to the manual nature of these mowers, they’re best suited for small or medium yards measuring less than 3,000 square feet. Tackling yards that are larger than this is going to become tedious with these manual mowers and will take a considerable amount of time. Deciding whether a reel mower is right for you depends on a few factors. These mowers are incredibly efficient, precise landscaping tools that leave grass perfectly manicured and neat while being healthier for you, your wallet, and the environment. If you’re thinking about purchasing one of these mowers, here are a few factors to consider. These mowers are much more affordable than gas-powered or electric mowers. Not only do they only cost between $70 and $200, but they have no associated operating costs. This means that using one of these mowers means no batteries, no electricity charges, and no paying for gasoline or oil. Manual push mowers are virtually maintenance-free. Unlike powered mowers, these tools require no oil-changes, replacement parts, charging, or refueling. The only maintenance you’ll ever have to do is perhaps sharpen the blades of these mowers every few years. Gas and electric mowers are loud, annoying both your family and your neighbors. But manual mowers are virtually silent, allowing you to enjoy being outdoors without the deafening sound of a mower in your ear. Additionally, these manual mowers produce no emissions. Compared to a gas mower which, in one hour of operation, emits the same amount of hydrocarbons as an automobile would on a 100 mile road trip, this is a huge health benefit to both yourself and the environment. Due to the average cutting width of between 14” and 20” and since you will be pushing your reel mower along your lawn, these mowers are best suited for small and medium yards measuring less than 3,000 square feet. Incredibly easy to use and affordable, a reel mower is a great choice for many homeowners. If you are looking for a healthier, more affordable, low-maintenance alternative to gas or electric mowers, it’s one of the best investments that you can make. Reel mowers are ideal for anyone with a small or medium yard. Pushing one of these manual mowers along on yards up to 3,000 square feet won’t be too tiring and, as long as you keep the blades sharp, you’ll be able to finish the job in no time. Our recommendation for the best pick of 2019 is the American 1815 18” Reel Mower. This high-quality lawn mower earned the top spot in our review. It was designed with an 18” cutting width which is great for even medium-sized lawns and with its 5 tempered alloy steel blades, it makes clean, precise cuts in every time. American has been making tools like this for over 120 years and this model is no exception to their solid reputation. It is easy to use but reliable and tough. With an adjustable cutting height from ½” to 2 ¾”, making adjustments to your type of grass or the seasonal needs is a breeze. If you are looking into recycling your cut grass, read the study. And its 29 lb frame is sturdy enough to be durable without hindering movement or slowing you down. There’s a reason why this model earned its high ranking in our review. Durable and delivering excellent grass-cutting ability, the American 1815 is one of the best mowers available and, at under $120, it’s one of the most impressive mowers available. One of the most impressive mowers featured in our review of the best manual mowers on the market today, the Fiskars StaySharp Max 18” Reel Mower is our recommendation for best premium push mower available. It’s easy to use and delivers impressive results. And with a number of great design features, is one of the best mowers in its class today. This 18” reel mower features InertiaDrive technology with thicker blades and a large-diameter cutting reel. This allows these mowers to cut with more power, tackle thick patches of weeds or the occasional twigs without jamming or slowing down. And thanks to its chain-drive design, these mowers are actually 60% easier to push than comparable manual mowers on the market. For added versatility, this 5 blade mower offers cutting heights from 1” to 4”, which is a very generous range for any homeowner. And speaking of its blades, these precision-ground cutting blades never touch the stationary wheel, allowing them to retain their sharp edge longer than most competing mowers. Plus, while one complaint about reel mowers is that edging can be slightly difficult, Fiskars has solved this with inset wheels. This allows the cutting blade to extend the entire length of the mower’s body, making edging along walkways or along landscaping a breeze. At just under $200, it’s certainly the most expensive push mower in our review but if you’re looking for an impressive and incredibly versatile option, it’s the perfect model for you. If you are looking for the best bargain on the market, the American 1204 Reel Mower is a great option. It earned a spot in our review of the best rated reel mowers on the market and is the best value around. It is incredibly compact and lightweight, making it easy to operate and store but still features the exceptional quality that we’ve come to expect from American, a brand known for making some of the best yard tools on the market. With a 14” cutting path and 4 tempered alloy steel blades, this mower is capable of making quick work of a small lawn while delivering clean, precise, efficient cuts. With adjustable cutting heights from ½” to 1 ¾”, setting your height is simple. And thanks to its compact design, this is the perfect option for tight areas around trees or shrubs, narrow walkways, or other hard-to-reach areas. At around $70, it’s one of the best products for anyone looking for an inexpensive mower. It’s one of the most affordable mowers featured in our review. But more importantly, it doesn’t ask you to sacrifice quality. This is a very well-made mower that is simple to use, delivers impressive results, and will withstand years of regular use. We hope you enjoyed our article on "10 Best Reel Mowers of 2019", if so, please share and rate it. 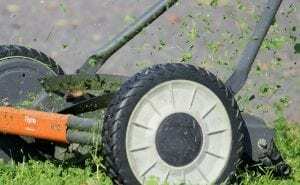 I thought I try out a reel mower as my electric mower broke and only having a small yard at the front and back I thought ill give it a go after reading this article.